straight through Breitenfeld, Schönfeld to Groß-Siegharts until end of road. Turn left there an then right at STOP sign. Drive up the hill and pass the church, keep left onto Schlossplatz (TBZ). keep straight until end of road. Turn left there an then right at STOP sign. Drive up the hill and pass the church, keep left onto Schlossplatz (TBZ). After having entered the town of Groß-Siegharts please follow the white/blue signs to "TBZ Technologie- und Bildungszentrum". The TBZ is located on a square right next to the old castle and the church. Just use the main entrance (black iron door) and find our offices on the 2nd floor. Welcome! 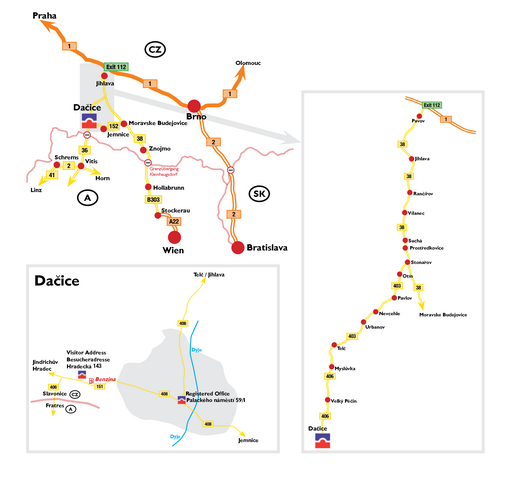 On the highway D1 direction "Brno" take "exit 112 - Jihlava-Pávov" and follow through the city of Jihlava, proceed on Znojemská Street and leave Jihlava on road #38 in the direction of "Znojmo". Follow #38 via Rančířov, Vílanec, Suchá, Prostředkovice until Stonařov. In Stonařov turn right from #38 into #403 and follow through the villages of Otín, Pavlov, Nevcehle and Urbanov along the road #403, which becomes #23 shortly before reaching Telč. In Telč follow #112 and then #406 via Myslůvka and Velký Pĕčin to Dačice. After entering "Dačice" continue until the centre main square „Palackého námĕstí“ and turn right there in the direction of Jindrichuv Hradec. Follow the rural road „Hradecká“ out of town passing some fish ponds until the BENZINA petrol/gas station on the right hand side. Turn right after the BENZINA station and enter the industrial site with theblue building. Our silver colour building is right behind with a car park right in front of it. Leaving Vienna on the highway A22 direction Praha, continue on the A22 until "Stockerau", where the A22 becomes B303. Follow the B303 Weinviertler Bundesstrasse via Sierndorf, Göllersdorf and Hollabrunn until you cross the border CZ/A in Kleinhaugsdorf/Chvalovice. On the Czech side proceed on #38 through Znojmo via Kasárna and Grešlové Mýto until Moravské Budĕjovice. In Moravské Budĕjovice turn left onto the #152 direction Jemnice and follow #152 via Třebelovice to Jemnice. From Jemnice take the #408 to Dačice Main Square (Palackého námĕstí). Continue straight there in the direction of Jindrichuv Hradec and follow the rural road „Hradecká“ out of town passing some fish ponds until reaching the BENZINA petrol/gas station on the right hand side. Turn right after the BENZINA station and enter the industrial site with the blue building. Our silver colour building is right behind with a car park right in front of it. On the highway D1 direction "Praha" take "EXIT 112 - Jihlava-Pávov" and follow through the city of Jihlava, proceed on Znojemská Street and leave Jihlava on road #38 in the direction of "Znojmo". Follow #38 via Rančířov, Vílanec, Suchá, Prostředkovice until Stonařov. In Stonařov turn right from #38 into #403 and follow through the villages of Otín, Pavlov, Nevcehle and Urbanov along the road #403, which becomes #23 shortly before reaching Telč. In Telč follow #112 and then #406 via Myslůvka and Velký Pĕčin to Dačice centre. After entering "Dačice" continue until the centre main square „Palackého námĕstí“ and turn right there in the direction of Jindrichuv Hradec. Follow the rural road „Hradecká“ out of town passing some fish ponds until the BENZINA petrol/gas station on the right hand side. Turn right after the BENZINA station and enter the industrial site with the blue building. Our silver colour building is right behind with a car park right in front of it. Our silver colour building is just behind and you can park your car in front of the building.